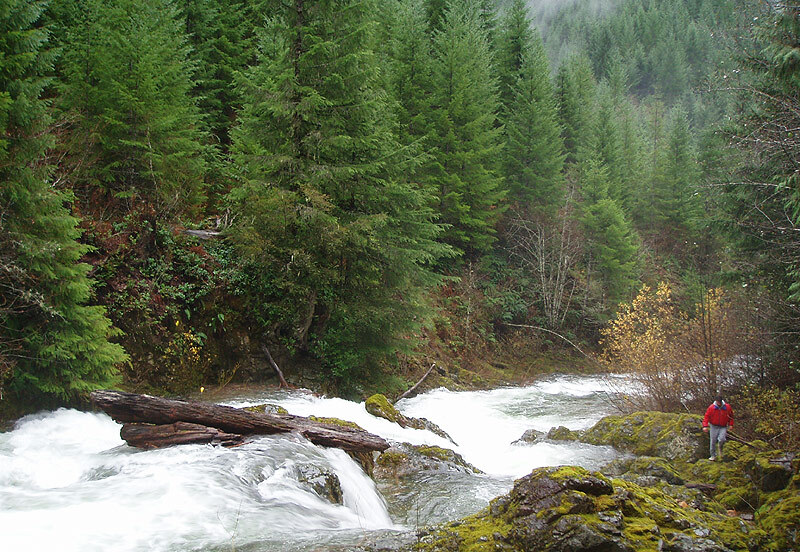 The Falls to Falls run on upper Elk Creek is a great way to spice up any trip to the Quartzville drainage. We had been looking at this upper part of Elk Creek for years, but the wood in the bottom falls prevented a clean run of this section. All of this changed recently after a high water event cleaned a logjam out of the second falls. Pete and I timed our trip just after that fortuitous event, and had a great run down this short but sweet section of whitewater. We decided to run Falls to Falls before Upper Quartzville to ensure we would have good flows in Elk Creek, which is the smaller of the two runs. During the shuttle we gave the second falls a cursory glance, knowing that we would scout it more thoroughly from creek level. Scouting the second falls from overhead during the shuttle. This is what you can see from the road. The ancient logjam that had been choking this drop was now gone, so it looked good to go! About a mile above the bridge marking the second falls is the first falls. 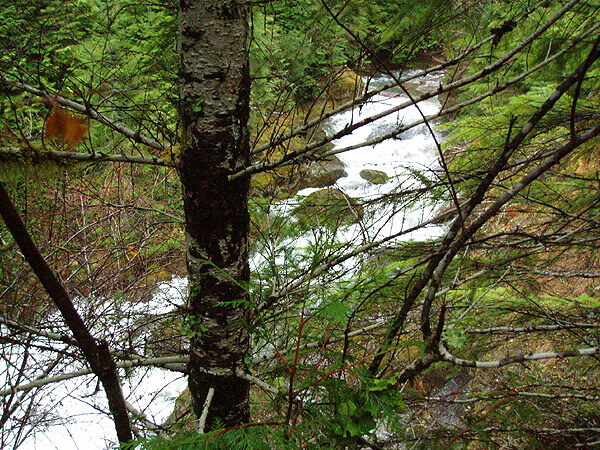 This large cascade marks the put in for the Falls to Falls run and is visible from the road if you know where to look. 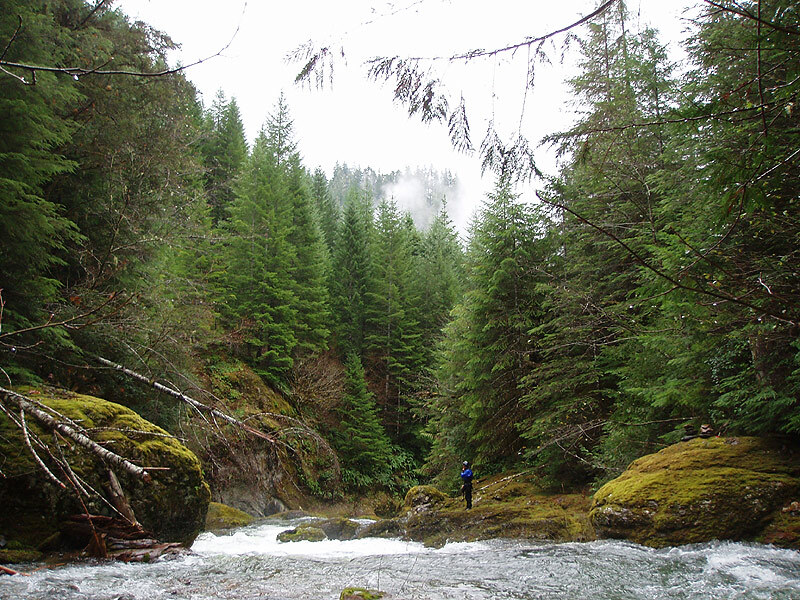 We hadn't really scouted this first cascade prior to this day, so we decided to climb down to creek level before gearing up to see what it was all about. Scouting the first falls before we put on from overhead. Our line was to start middle on the first tier, then charge right and stay far right the rest of the way down to avoid the nasty piton rock on bottom left where most of the water is going. The first falls had some consequences. Basically, you can't go left or you're in big trouble because all of the water falls onto a rock at the bottom. So, after scouting for a bit we decided that you start middle and drive right, dropping over the more benign-looking double drop on the right. 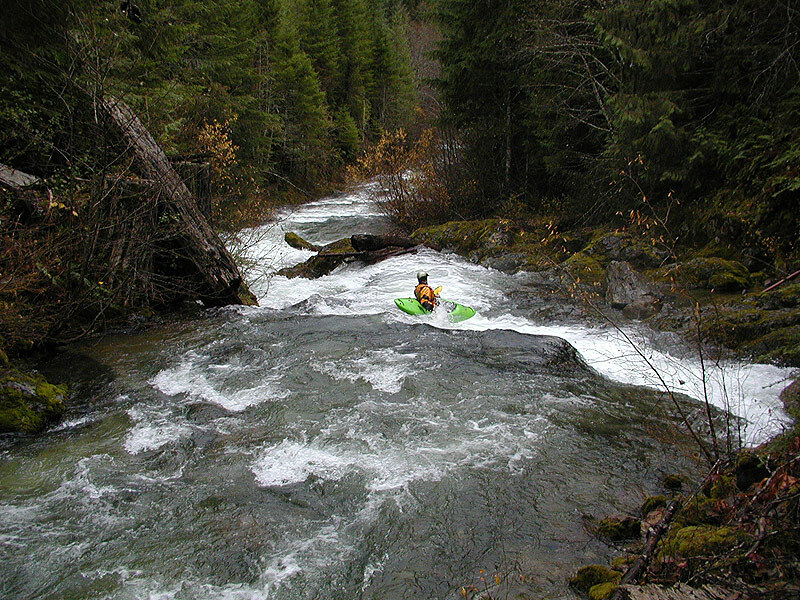 Pete Giordano scopes out the complex and technical first falls from river right. You don't want go left at the bottom of this one or you're in big trouble. We got our gear on and I was feeling super psyched. I asked Pete if it was ok if I went first, and he shrugged and said "All right, I'll take a picture.."
Because the first move over the first tier was so critical, I ferried across the creek and climbed down on the creek-left side to watch the movement of the water and determine exactly where I needed to be in order to make it over to the right side. After a bit of study, I picked my line and went back up to my boat. I peeled out and hit the boof, drove hard to the right and dropped over the second tier, going deep and catching an eddy above the final drop.. 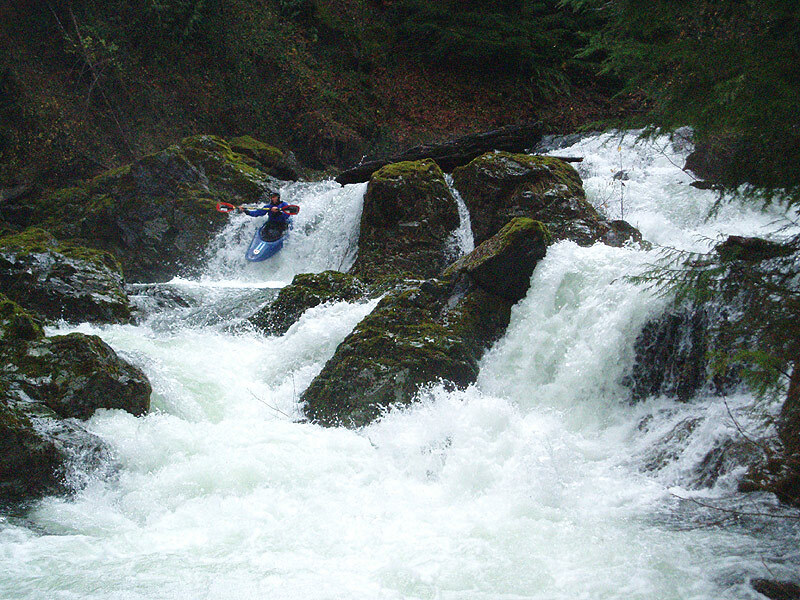 I peeled out and ran the bottom flume and caught a small eddy on the left side of the creek with a yell.. Too much fun!! The author probes the first falls. This is the tricky part because most of the water goes left below this first drop. You have to move right aggressively to avoid the dangerous left side after this opening move. Pete came down next and looked very smooth as usual, making the move to the right and cleaning up on the bottom two drops no problem..
Pete Giordano runs the second tier and relaxes after the crux move. The creek-left piton rock at the bottom is clearly visible in this photo. Anyone who misses the move to creek-right at the top faces either a massive piton or a bad pin or both..
Downstream were some smaller drops and lots of bedrock without any significant drops leading up to the road bridge which marks the second falls. We paddled down under the bridge and got out on the creek-right side to scout the second falls. This cascading falls starts with a long slide into a hole, then some boily water leading up to the main drop, which is about twelve feet total. The creek-left side is more vertical at the bottom, and the creek-right side is more of a plunge into a big hole. Pete Giordano scouts the second falls. There are two possible lines at the bottom. The hole halfway down the drop deserves careful attention, and the middle of the final drop is shallow. Stay out of the center at the bottom and you'll be fine. Since I broke my back at Spirit in '01 I don't run the vertical drops anymore, so I opted for the creek-right side and the hole. Pete picked the creek-left side and the boof. I studied the right side for awhile because the entrance to the final drop is guarded by a boulder-sieve-hole thingy that looked very unpleasant. I figured I could get past it though with just the right boat angle, so I went back up and got in my boat. I ran the first slide no problem and punched the hole without difficulty, and luckily the boils didn't mess with me too much as I lined up on the bottom drop. The boulder-sieve guarding the top of the right side bottom drop looked very bad from creek level, but I boofed past it no problem and ran down through the hole, shooting out into the pool below with another yell.. Great fun! Pete squares up on the bottom drop after punching the sticky hole at the bottom of the first pitch. There are two possible lines at the bottom, the left boof or go right through the hole. Pete went left, I went right. You can see the shallow center in this photo, which isn't really an option. The view of the canyon below the second falls. 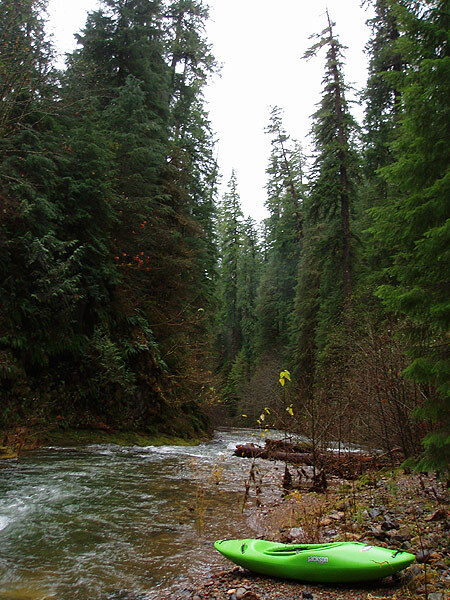 This is a beautiful place, with crystalline water and majestic old growth timber. 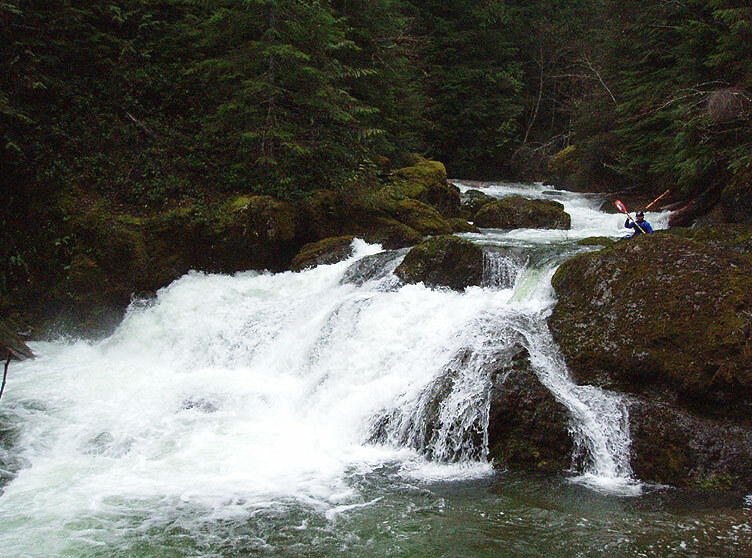 The creek below the second falls has some smaller ledges and drops to keep you entertained to the take out. We had about 3,000 cfs on the Quartzville gauge, falling from a high level after a flood. This was a nice medium flow, though more water would be fine because the creek between the falls was a little scrapy in places. Both of the falls could take more water as well and not become noticably more difficult. You wouldn't want to run it any lower than 3,000, because the upper falls would start to close out on the right and only leave the nasty left side as an option. Access is easy. Turn left up the road where Upper Quartzville and Canal Creek come together and drive up to the bridge over Canal Creek, where Elk Creek and Canal come together. This is the take out. 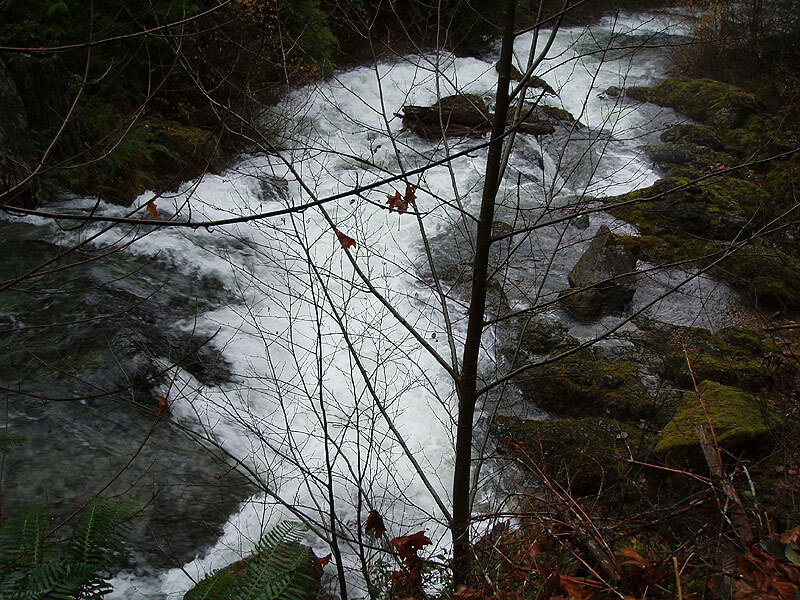 The put in is about two miles upstream at the upper falls, which is barely visible from the road if you are looking for it. On the way up you'll pass another bridge which marks the bottom falls. It is pretty hard to scout that one from the road, you're better off doing it from creek-level like we did. Note: Pete and I later ran the main stem of Canal Creek upstream of the confluence with Elk Creek. The upper reaches of Canal are located deep in a canyon with no road access so we faced a long climb down through very steep terrain to reach the creek. I'll post that trip report some other time.